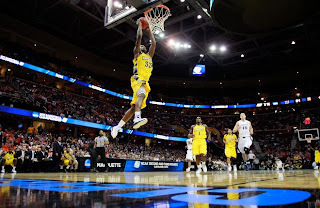 Marquette "Upsets" Xavier ~ The Bucky Channel - The World of Sports from Wisconsin's Perspective. Despite coming into the tournament as an 11 seed, the Marquette Golden Eagles were able to play some solid, steady basketball on Friday night in its 66-55 win over 6th seeded Xavier. Marquette came out and scored the first two points of the game, and then quickly found themselves in the drivers seat for the rest of the game. I was a little upset at first about this match up, because I felt these were two very good teams and as a basketball fan I wanted to see them both go far into the tournament. I still think Marquette should have been more like a 9 seed, and Xavier should have played a different team. Either way you are stuck playing who you get seeded against, and for Xavier the matchup against Marquette proved to be a costly one. It seems ever since Ray Allen, Kevin Garnett, and Paul Pierce teamed up in Boston the term "Big Three" has been used more more and more often. But on Friday night, Marquette's version of the "Big Three" played solid on both sides of the ball. Darius Johnson-Odom led the way with 19 points. Jimmy Butler scored 15 points, and had team highs with four assists and three steals. Jae Crowder led the team with six rebounds. So each of the Big Three helped in different ways to get Marquette into the third round. I'm glad the Golden Eagles came out, played well, and showed that they are better than an 11th seed. On Sunday Marquette will face a fellow Big East team Syracuse at 6:45pm Milwaukee time. Marquette beat them in the regular season the one time they met, but it was at the Bradley Center. This time it will be at a neutral site, so anything can happen. Syracuse took down Indiana State by 17 Friday night, and they also looked good. If Marquette can play like they did against Xavier they have a chance to steal this one. It won't be easy, but hey that is why they call it March Madness. You never know who is going to come to play, regardless of what they may have been seeded.